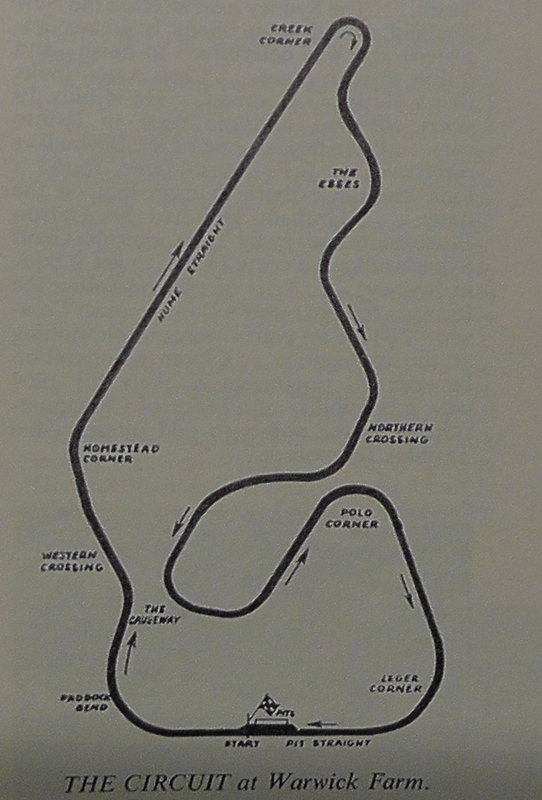 This would be the second Snetterton race meeting promoted by the circuit’s new owners – Motor Circuit Developments (the first was a club meeting held on March 17) – and therefore by John Webb, whose airline, Webbair, had become a regular part of motor racing logistics since the late 1950s. 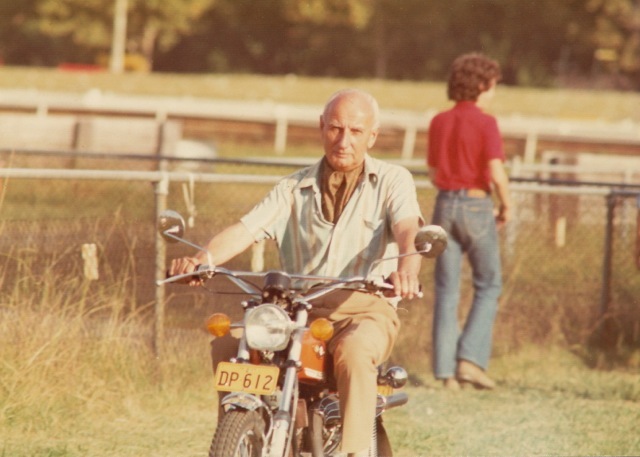 As a journalist, manager and, as I say, race promoter, Webb would in the 1960s and 1970s become one of the most influential figures in British motor sport. With support from Grovewood Securities, the Grovewood Awards, to name but one of Webb’s creative ideas, would eventually pave the way for today’s Autosport Awards. The Lombank Trophy was the first F1 race of the year – a non-championship race, to be sure, but a significant one nonetheless. Lombank was one of several London-based financial “institutions” (as investment banks were known then!) to see the benefits of motor racing sponsorship, although by a certain irony this Snetterton race would be the first since one of Lombank’s major competitors – UDT Laystall – announced their withdrawal from F1. 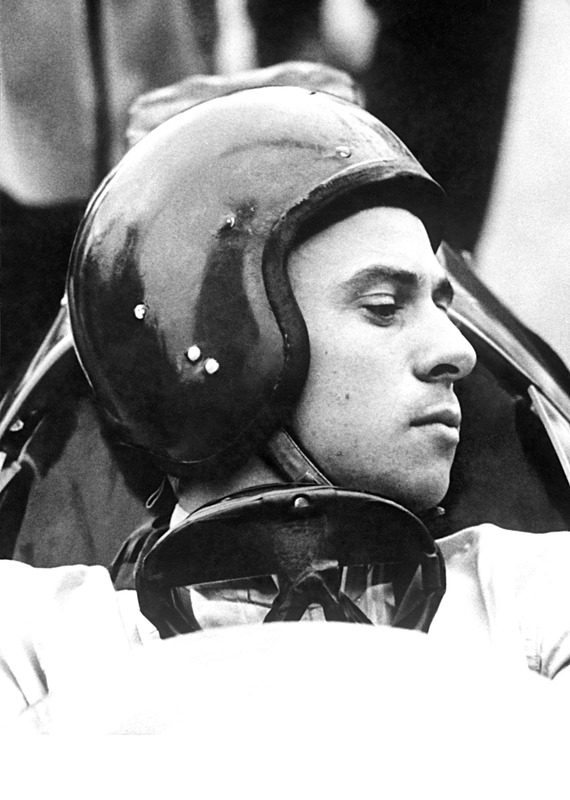 Porsche’s loss was Jack Brabham’s gain: Dan Gurney signed over the winter to drive a second factory Brabham in 1963, and John Surtees stepped from Lola to Ferrari. (I can’t help reflecting here that Jack Brabham “lent” Big John his personal Lotus 24 to race in the end-of-season, 1962, Mexican GP, for Bowmaker Lola were by then concentrating on the upcoming Australasian Series and entered only one Lola in Mexico for Roy Salvadori. John promptly qualified the 24 on the second row, only fractionally slower than Trevor’s Lotus 25. Brilliant. Surtees drove most of the New Zealand-Australia series for Bowmaker Lola but his place at Sandown Park, Melbourne, interestingly enough, was taken by Masten Gregory. Tony Maggs finished third at Sandown in the last appearance of a Bowmaker Lola entry.) 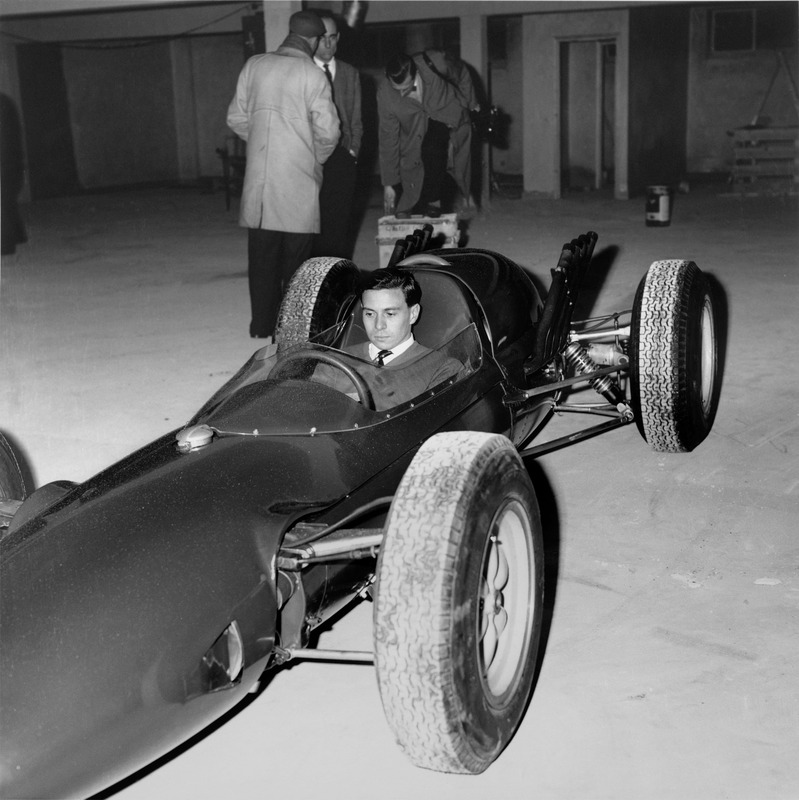 ATS, led by former Ferrari engineer, Carlo Chiti, would also be entering F1 in 1963 with drivers Phil Hill, Giancarlo Baghetti and (for testing) Jack Fairman; and this would also be the first race for Coventry Climax since being bought by Jaguar Cars Ltd. The Lombank Trophy race (won in 1962 by Jim Clark) was held on Saturday, March 30, at 3:00pm, with practice taking place on Friday. Public address commentary was in the care of the excellent Anthony Marsh, the recently-appointed Publicity Officer for Brands Hatch, Mallory Park and Snetterton and the lynchpin, of course, of the Springfield Charity that still exists today. 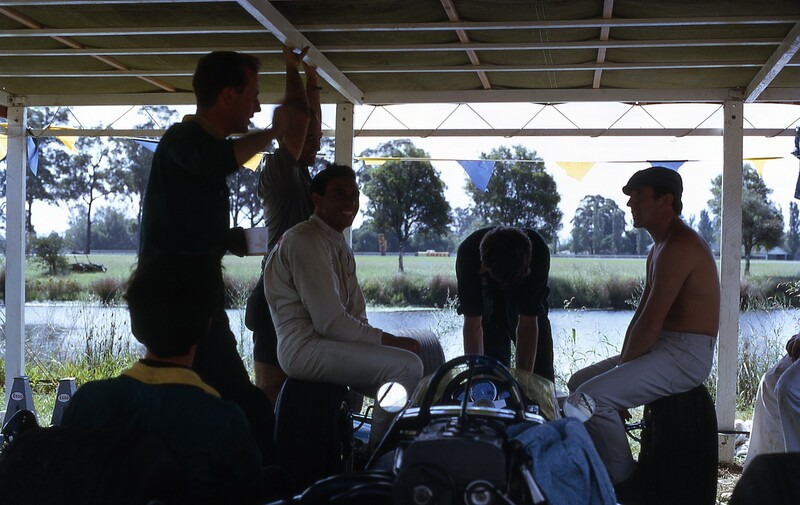 Team Lotus entered two Lotus 25-Climaxes for Jim and his regular team-mate, Trevor Taylor but a shortage of engines (ie, one Climax V8 only!) rendered Trevor a non-starter. Jim’s race engine, indeed, was way down on power. Climax had planned to bring the new, 200bhp fuel-injected V8s to Snetterton for use by Lotus and Cooper but, like BRM, ran out of time. Speaking of the Cooper Car Company of Surbiton, Surrey, Bruce McLaren flew from Sydney to the US after winning his fourth Australasian series race at Sandown Park, Melbourne with his Intercontinental Cooper-Climax – (this is a sad story, but I’ll tell it less we forget: Bruce sold that car to Lex Davison, who raced it successfully in 1963-64 and who in turn then used it to enable the young and talented Rocky Tresise to make his career breakthrough in 1965. Tresise died in a start-line accident at Longford with the Cooper, as did the talented Australian photographer, Robin d’Abrera; it was Robin’s pin-sharp images that captured Bruce’s Sandown win in the Cooper for Autosport back in March, 1963) – and at Sebring raced the Briggs Cunningham Jaguar E-Type. He finishing eighth there, partnered with Walt Hansgen. Cooper entered only Bruce at Snetterton – again in a 1962 T60 car. The interesting Cooper entry from Morris Nunn failed to appear; and Jo Siffert pulled out after hitting a bank on the very wet practice day in his Filipinetti Lotus 24.
was easily fastest on Saturday, lapping in 1min 44.4 in the torrential rain despite trouble starting the car (due to a lack of warm-up spark plugs). Eventually the 25 was tow-started into life. With Graham Hill’s BRM suffering from chronic fuel injection problems, Richie Ginther was next quickest (1min 46.8sec), followed by Bruce (1min 48.8sec), Innes Ireland in the BRP Lotus 24 and Innes’s team-mate, Jim Hall. On Saturday the weather continued. 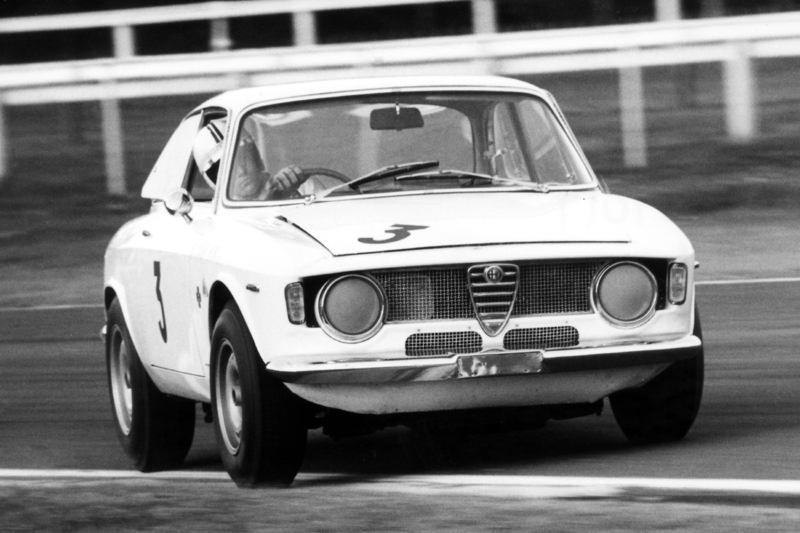 Snetterton became a quagmire of mud, rain, wind and spinning wheels. There were no branded jackets back then, there was no North Face, no Timberland. Instead, long raincoats, cloth caps and Wellington boots ruled the day. Les Leston’s racing umbrellas – each segment representing a marshal’s flag – were also at a premium. Richie led from the line, using the superior torque of the BRM engine to full advantage, with Bruce second and Jim an initial third. Jim quickly took second place at the hairpin – the left-hander at the end of the long back straight that runs parallel to the A11 – and passed Richie at the same place a few laps later. 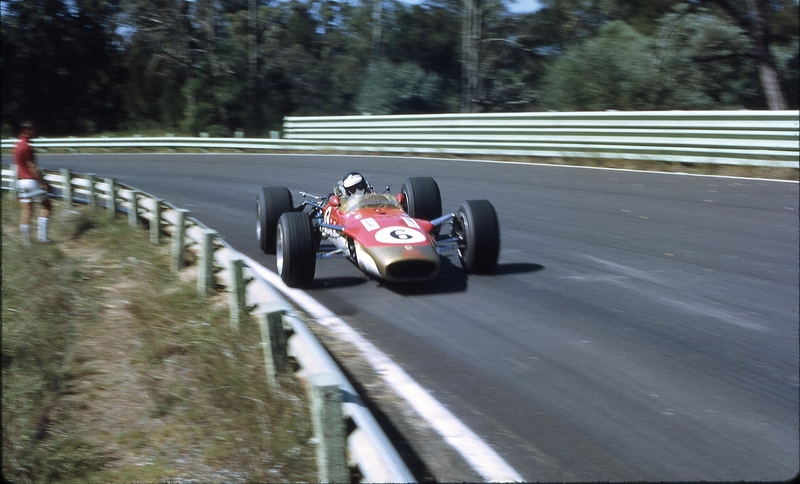 Significantly, though, Richie was able to out-accelerate the Lotus. All were running on the new Dunlop R6 but the traction advantage was with the BRMs. Graham Hill had meanwhile flown through from the back of the grid. He quickly passed Bruce and, now on a spray-free road, quickly caught Jim and Richie. Jim took the lead and began to pull away – but then ran wide onto the grass while lapping a back-marker; Richie again ran at the front. There was no stopping Graham Hill. 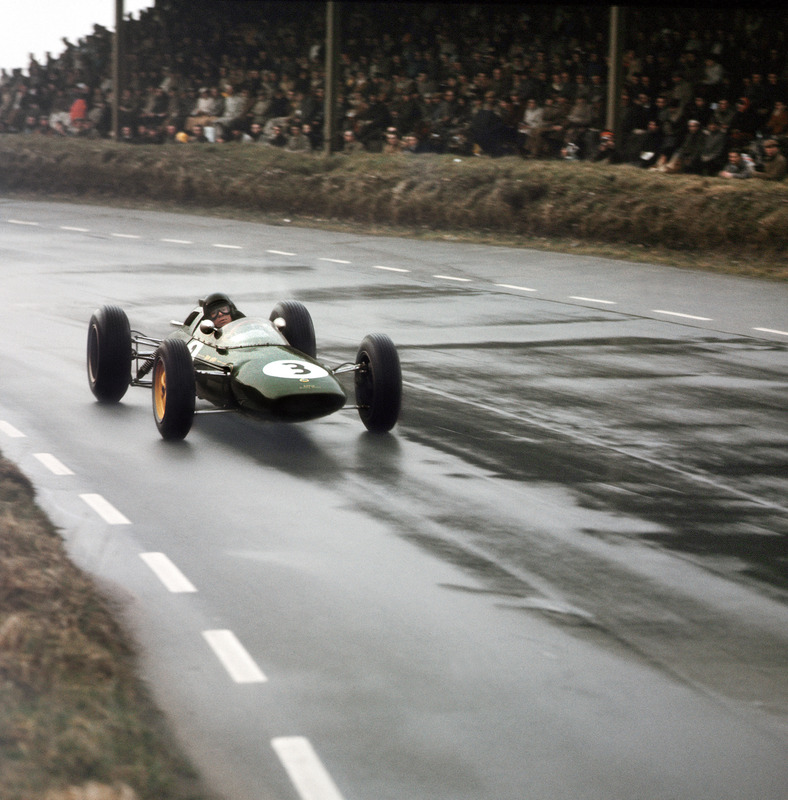 Driving superbly in the rain, he passed both Richie and then Jim to win decisively. Unhappy with his engine, and finding the 25 surprisingly skittish in the wet, Jim backed away and settled for second place. Innes Ireland eventually finished third, although not without incident. During his battle with Bruce, the pair of them had lapped Innes’ team-mate, Jim Hall. Innes slipped past without problem but then, with hand signals to Hall, made it clear that he wanted his team-mate to hold up Bruce for a corner or three. You can imagine if Fernando Alonso today suggested to Felipe Massa (running a lap behind) that he hold up Seb Vettel for 20 seconds or so. As it was, Bruce afterwards dismissed the episode as “a legitimate team tactic”. Such was Gentlemen Bruce. The Lombank meeting boasted a superb support-race programme. 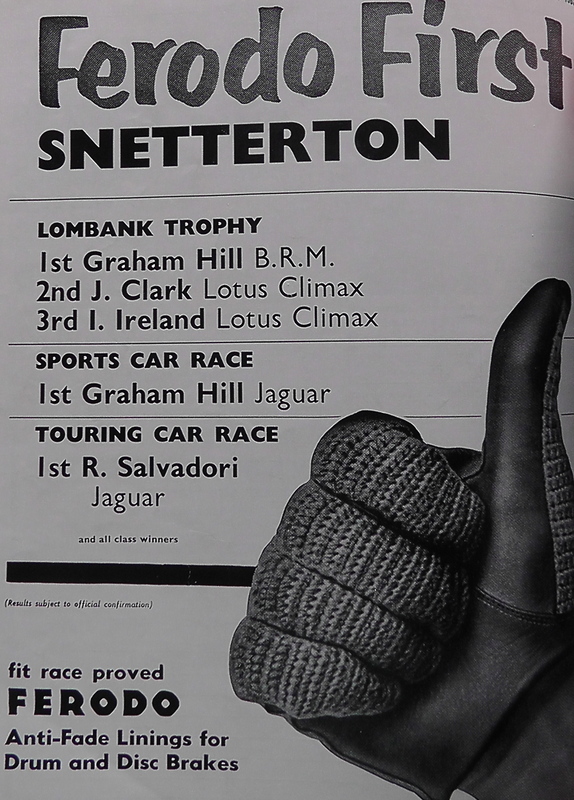 The World Champion was also victorious in the 25-lap sports car race with John Coombs’ lightweight Jaguar E-Type (ahead of the Cooper Monaco of Roy Salvadori, now retired from F1); Roy made up for that by winning the Jaguar 3.8 battle in the 25-lap Touring Car race, gaining revenge on Graham Hill (who fought his way back from sixth place). Mike Salmon, also in a 3.8, finished third. Both Normand Racing Lotus 23s (driven by Mike Beckwith and Tony Hegbourne) had looked quick in the sports car event but eventually, in the wet, had to cede position to Alan Foster’s amazing MG Midget. It should be noted that Frank Gardner also raced the new Brabham BT8 sports car at Snetterton, winning the 1151cc-2000cc class. I mention the Normand Lotus 23s because Jim signed over the winter to race for Normand whenever his schedule allowed. Just such an opening would appear at the BARC’s Oulton Park Spring Meeting on Saturday, April 6. After the beauty of the AGP 60th anniversary celebrations at Albert Park, it’s a shame that not more is being made of this being Sepang’s 15th F1 birthday. I know it’s not a major milestone but, so far as modern supercircuits go, Sepang has done well to get this far. It has none of the carnival atmosphere of Melbourne; it’s hot and debilitating; but it does boast some incredible corners and it does have the Malaysian government full-square behind it, despite relatively small crowds. 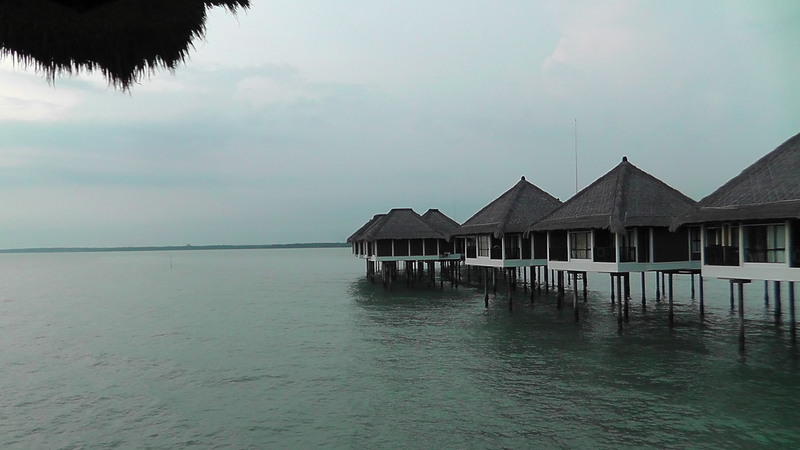 Personally, I love Sepang. I just wish the weekend as a whole had a bit more AGP-style gift-wrapping. Speaking of great corners, I spent Friday watching our aces through the very quick left- and right-handers they call Turns Five and Six. I’m particularly fond of this section because there are about three different solutions to the problems posed by high-speed changes of direction. You can really lean on the right rear as you go in, then ask a lot of the car as you pivot it back to the left rear for the dive into the right-hander (as Mark Webber, Romain Grosjean, Paul di Resta and Sergio Perez were doing); you can compromise the left-hander a little and move the car way over to the left for the right-hander that follows (as Nico Rosberg and Jenson Button were neatly doing); or you can ride a very narrow line of perfection by finding the tiniest of “neutral” zones for the change of direction between the two corners (as Kimi Raikkonen, Sebastian Vettel, Fernando Alonso and Adrian Sutil were doing). The last group also tucked in a little earlier to the apex of the right-hander (Turn Six), thus shortening the corner. All this in a flash of a second – but easy to see from the elevated vantage points both on the inside and outside of the corners. Best through this section? Kimi, by a car’s width or two, although Lewis never really looked as though he was on the absolute limit. 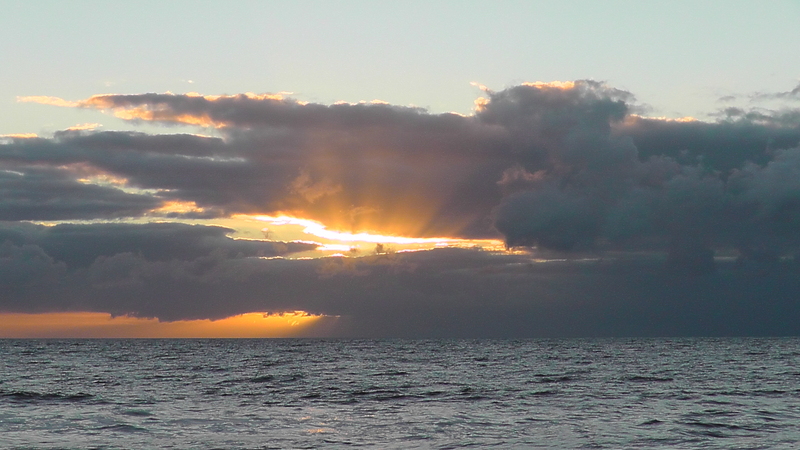 Then it rained. For the second race in a row, plaudits must go to Sauber’s new signing, Esteban Gutierrez, who looked very relaxed and supple in the semi-wet. There was about a five minute period of reasonable consistency, weather-wise, in FP2, and Gutierrez for this little cameo was right up there with Romain Grosjean, Nico Rosberg, Mark Webber and Fernando Alonso. He was fastest, indeed, on my stopwatch. Romain had a big moment at the aforementioned high-speed esses but – unlike Melbourne – Esteban kept it all nicely on the island. Sauber didn’t have the greatest of days in the dry (fire extinguisher and cracked exhaust issues) so this should have cheered them at least for ten minutes or so. Also impressive in the wet (as in Melbourne) was STR’s Jean-Eric Vergne. Unlike Kimi (who should know better) JEV also kept his car nicely to the right-hand side of the finishing straight all day whilst accelerating through the gears. Kimi, for some strange reason, was running diagonally across the straight over to his braking point for Turn One. It was good to see Daniel Riccardo juggling a trio of tennis balls as he walked to his garage this morning. I’m sure most F1 drivers are able to juggle if they put their minds to it, but it’s not often you actually see the skill in motion in the F1 paddock. Ross Cheever, the mega-quick American, was also a serious juggler and we know that both Lewis and Nico are mono-cyclists of some repute. Then there’s Kimi. I’ve seen him balancing a motionless mountain bike for well over a couple of minutes. Again, I’m sure he’s not alone. Why don’t we organize some sort of “circus” day for the F1 stars? It’s one thing to see them plying their skills at 280kph. It would be quite another to seem them displaying their co-ordination, balance, timing and eyesight in ways that we can all understand. I may be wrong, but I suspect – I say I suspect – that still nothing has formerly been done about the pre-race national anthems. Certainly it looked to be the usual shambles in Melbourne. 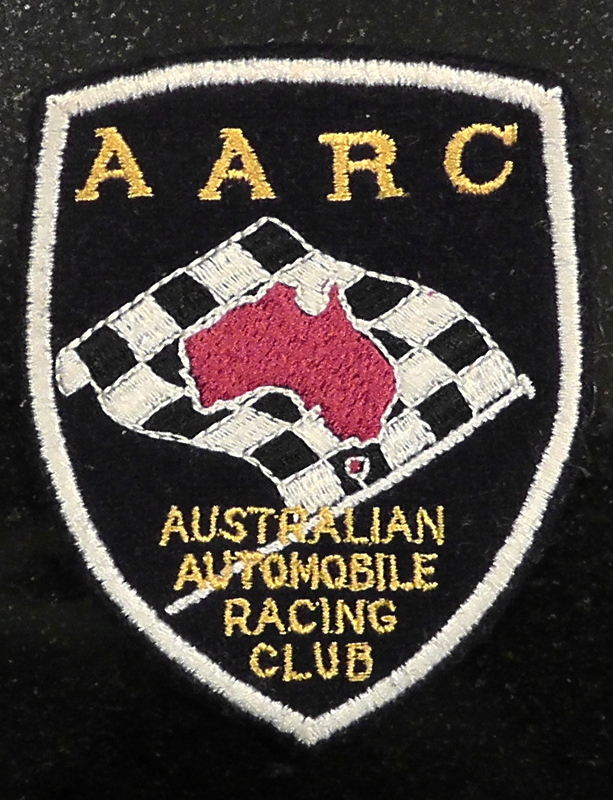 The AGP Corporation, like all organizing bodies, went to great lengths to execute the anthem with a local singing star and with suitable respect for their country – “Please be upstanding for the National Anthem of Australia”, said the circuit PA – but the F1 world, from what I could see, just went on about its business on the starting grid, sucking drink bottles, looking at watches (sorry, “timepieces”), checking tyre warmers, downloading data and generally milling around. There was no observance whatsoever, in other words, of the local national anthem. 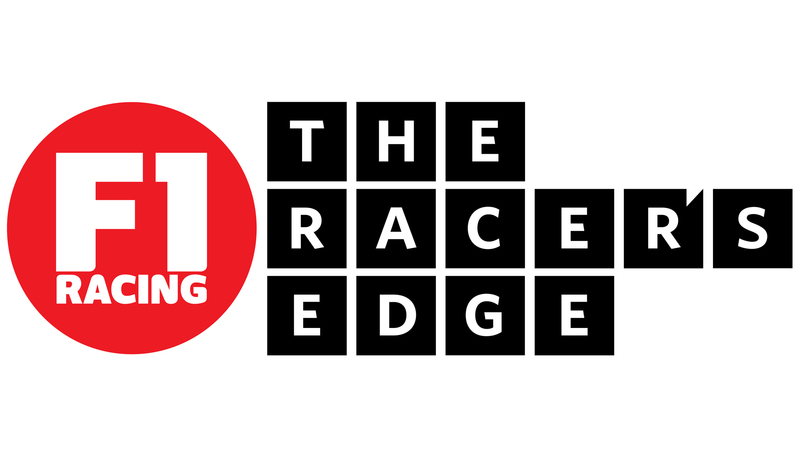 Can it be that hard for the F1 industry to set itself a new standard of behaviour? We can’t expect the drivers to stand to attention – or even sit to attention if they’re already in their car – but why isn’t it de rigour for each team to nominate a representative to stand to attention at the front of the grid whilst the anthem is played? Is the opening anthem any less important than the post-race podium anthems? Pre-race, the TV cameras could pan along the row of uniforms, rugby-style, and commentators could stay quiet for a minute whilst the anthem is respected. It would be a poignant, respectful moment. A moment that at present we don’t have. And that, I think, is wrong. Anyway, time for dinner. I’m staying at an amazing hotel called the Golden Palm Tree. Our cottage is on stilts; the water shimmers beneath us; and the circuit is but a 40-min adventurous ride away in a battle-scarred Proton. This weekend the locals are due to set fire to elaborate paper decorations they’ve been keeping specially for the occasion. Should add nicely to the general heat and haze. 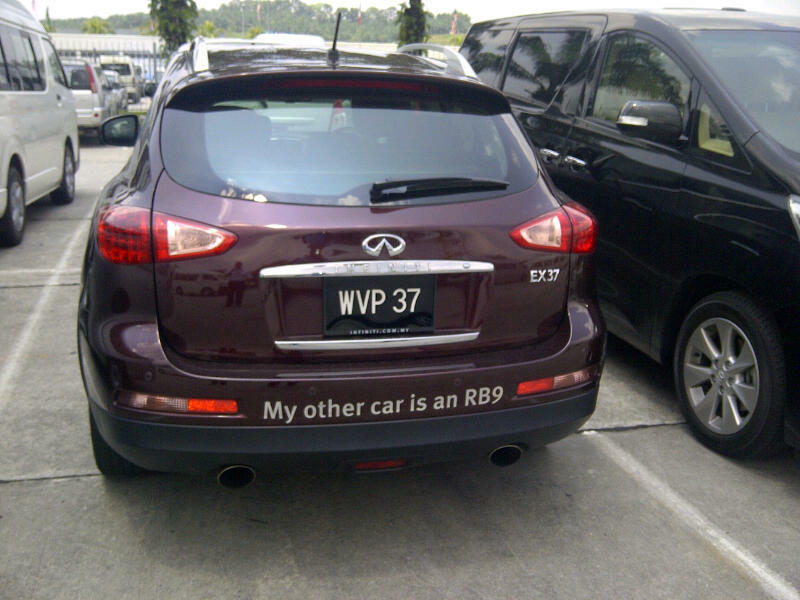 As I say, I love Sepang.